There’s a book that has magical qualities  and not all for the good. 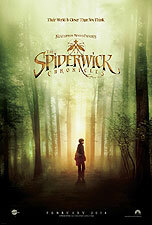 The Spiderwick Chronicles is a world created by Arthur Spiderwick. There’s goblins, Hogsqueals, snakes, monsters, trolls, and much more. When the book falls into the wrong hands, all heck is about to break out. Thanks to Nickelodeon Studios and Paramount Pictures, The Spiderwick Chronicles is coming to the big screen. 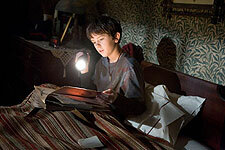 It stars Freddie Highmore, Sarah Bolger, and Freddie Highmore  yes, Freddie plays twins Simon and Jared Grace, while Sarah plays sister Mallory; Mary-Louise Parker plays their mom and David Strathairn is Arthur Spiderwick. Lending his vocal talent to the project is Martin Short as the helpful Thimbletack and his alter ego, Bogart; also Seth Rogen voices the lovable Hogsqueal. And Nick Nolte plays three different roles of the same character (don’t want to give too much away, so I’ll leave it at that). ComingSoon.net was invited to the one and only ILM/LucasFilm complex in San Francisco, as well as Tippett Studio to check out what they’re working on for the upcoming children’s flick. Our first stop on the trip was to ILM in the Presidio, George Lucas’ new home for his company. The complex is split into three different sections  ILM, LucasArts, and LucasFilm. Now, there are some people who would give their right arm to walk the halls and see items from Ghostbusters (Slimer! ), “E.T.,” the “Harry Potter” films  oh, and a little film series called “Star Wars” (you may have heard of that). We strolled by pictures, figurines, and many of the actual items used in the films designed by Lucas’ team. It was then time to see what’s in store for The Spiderwick Chronicles. We met up with director Mark Waters (Freaky Friday, Mean Girls). He showed us a few clips from the film, mostly all complete with some of the amazing special effects created by Tippett Studio and ILM. One of the characters created by ILM was the Griffin, a half lion/half eagle; the animators explained how difficult it was to build that from scratch because of the intricacy of the feathers. Tim Alexander and Tim Harrington of ILM gave us a history lesson of the 27 years of ILM that was so spectacular, I couldn’t just write a one or two paragraph insert. A separate story on just ILM will be popping up in the very near future. We had a great chat with Mr. Tippett about creating some of the actual monsters used in The Spiderwick Chronicles. Mark Waters joined the talk and the two joked about Phil running around on set with the monsters in his hands yelling at the kids. After that, some of the other animators showed us what parts of the film they worked on. For the film, ILM is designing the characters of Mulgarath, Thimbletack/Bogart, the Griffin, the Sprites (female flower creatures), and Stray Sod. And Tippett Studio is designing Hogsqueal, the Troll, Red Cap (voiced by Ron Perlman) and his army of goblins, plus the Bull Goblins. All in all, a very fun adventure. Stay glued to ComingSoon.net for interviews with Mark Waters, Phil Tippett and the rest of the animating team behind The Spiderwick Chronicles, coming to theaters on February 15, 2008.